After Being Spayed, Can Cats Still Want to Be a Mother to Kittens? American shorthair cats are known for being patient, loving and affectionate. 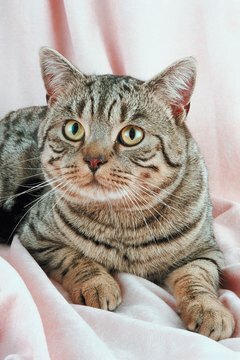 Key, an American shorthair, was spayed around her fourth year, after successfully giving birth to a litter of kittens. After her spaying, she continued to clean, lick and nurture every kitten who crossed her path, even the kittens who didn’t belong to her. Is Key the rule or an exception to the rule? Unfortunately, Key is the exception to the rule. In general, cats are very territorial and do not play well with new friends. Cats are solitary predators and they often go out of their way to avoid each other. “For example, one cat may occupy a spot in the morning but leave it for another cat to occupy in the afternoon,” writes Cats International, a non-profit organization dedicated to feline education. When it comes to kitty relationships, there are many more moments of independence than togetherness. A female cat’s maternal instinct is nothing new, until it’s applied to a new cat in the home. A mother cat is able to suppress her desire to hunt and focus on rearing her babies. It’s when her babies are taken away that her maternal instinct is unfulfilled. In these cases the mother cat may begin looking for another pet to nurture to fulfill her instinct. Being spayed does not affect the female cat’s desire to nurture. During the spay surgery, the female's reproductive tract is removed. Your cat’s personality does not change during spaying, except that she’ll no longer fall into periods of heat. A cat in heat will often seek out attention. This will stop immediately after the spaying has taken place. There’s no evidence to show that spaying an adult female cat does anything to disrupt the instinct to parent. Then again, most cats won’t have this instinct toward a new kitten in the home. Do not rush integrating cats, even an adult cat to a new kitten. Multiple introductions may need to take place before the cats can coexist. It’s likely you’ll run into a lot of hissing, growling and negative behavior. Or, you may find your adult female cat is just like Key, completely willing to adopt the new kitten as her own. Don’t immediately throw the kitten in with a resident cat. Instead, separate the new kitten into a room all his own. Then you can watch the behaviors of your resident cat. If she's purring, curious and rubbing herself against you, you may have a natural mother on your hands. If she’s hissing, growling and avoiding you, it’s going to take some time before these two can get along. You may run into some problems after integration has taken place. The cats are free to roam the home together, but you hear them fighting late at night or there seems to be some urination happening in places other than the litter box. The easiest way to create harmony is through separation. Move food bowls to opposite ends of the room, gradually moving the bowls closer together as time passes. Also maintain separate litter boxes, as this will cut down on territorial urination. Finally, provide cats with their own spaces to relax and isolate themselves. This gives them a sense of territory.